external code integration : the common language provide a simple an elegant way to abstract complex transformations on data through the integration of external code within procedures. The external code to be provided depend on tools used i.e, an executable implementation in order to simulate and model check, or a first-order axiomatic definition in order to use it inside a prover, etc. static analysis : IF provides the dfa tool which implements classical static analysis techniques such as live variable analysis, dead-code elimination and variable elimination (backward slicing) with respect to user-defined criteria. 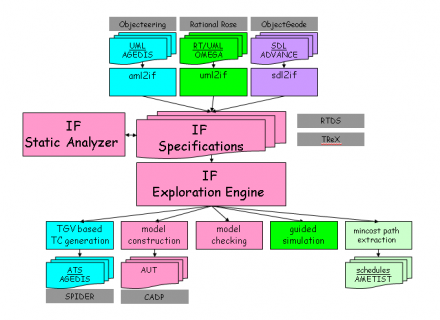 model-checking : The core component of the IF toolbox is the IF simulator allowing to explore the underlying semantic model (i.e, state graph) of an IF specification. Several exploration modes are imlemented : interactive (user-driven), random or exhaustive (breadth-first or depth-first). Partial order reductions can be applied in exhaustive- depth first search. test generation : The IF simulator has been connected to the TGV test generator in the context of the AGEDIS project. See the AGEDIS web page for more details. model : This library gives access to the abstract syntax tree (AST) of IF specifications. It can be used to implement tools operating "statically" on the specification such as translators to other languages, static analysis and optimisations at source level. simulator : A simulation library providing the minimal functionality for on-the-fly state-space traversal (state representation + successors computation) is provided. It can be used to implement tools operating "dynamically" on the specifcation such as exploration tools, model-checkers, simulators, etc. Simulation : step by step execution, inspection of the system state, conditional breakpoints, scenario rewind/replay, manual resolution of non-determinism, control of scheduling policy and time related parameters, etc. 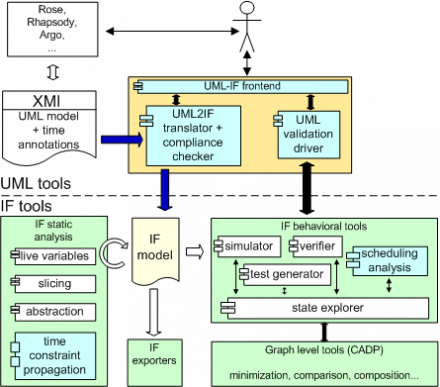 the UML-to-IF translator which takes as input a UML model stored in XMI format. The model may use standard UML constructs and extensions defined by the Omega profile : actions written in the Omega action language, timing annotations and observers expressing model properties (more infomation on the profile). Guidance, Navigation and Control modules perform the fine-grained control of the launcher’s flight parameters : monitor thrust and other parameters, calculate aiming, etc. 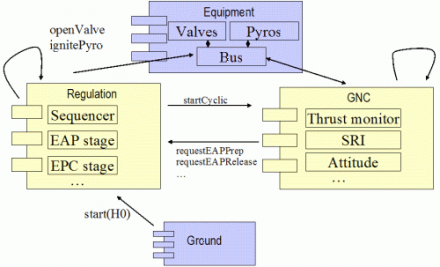 Property 1 : Between any two commands sent by the flight software to the valves there should elapse at least 50ms.